Every year a unique event takes place in Stratford-upon- Avon to mark the birth of the world’s greatest playwright. The Birthday Celebrations are a tradition going back nearly 200 years and are held on the weekend closest to William Shakespeare’s birthday. For photographic highlights of Shakespeare’s Birthday Celebrations held in previous years, click here. September 6-8 David Garrick’s Jubilee held in Stratford, the first celebration anywhere in the world of Shakespeare’s life. The foundation of Stratford’s Shakespeare Club, the oldest surviving such Club in the world, formed in order to organise celebrations for Shakespeare’s Birthday. The Shakespeare Club marks the birthday itself (23rd April) with a procession to Holy Trinity Church and a ceremonial dinner. First parade of costumed characters, much enlarged in 1827 and 1830. The Birthday celebrations were spread over three days and included the laying of the foundation stone of the first permanent theatre in the town. The purchase of Shakespeare’s Birthplace for the nation. The Tercentenary of Shakespeare’s birth, and the most elaborate celebration of his birthday since Garrick, lasting for over a week. April 23 The grand opening of the Shakespeare Memorial Theatre and the beginning of regular performances to mark Shakespeare’s Birthday. The boys of King Edward VI School – Shakespeare’s former school – parade to lay a formal wreath at Shakespeare’s grave, which becomes an annual event. Over the years the tradition grows to include the flag unfurling ceremony and wearing rosemary for remembrance. 23 April Thomas F Bayard, the American Ambassador, unveiled the American window in Holy Trinity Church as part of the Birthday Celebrations. The link with the Court of St James is established. The procession from the Town Hall to Holy Trinity Church included the boys from Shakespeare’s School and members of the public were invited to join in bearing offerings of flowers. More elaborate Birthday celebrations organised by a large committee, including the flying of national flags. The procession for the first time paraded from Shakespeare’s Birthplace to Holy Trinity Church. The tercentenary of Shakespeare’s death. The tercentenary of the publication of the First Folio. The Birthday celebrations were filmed for the first time. The Shakespeare Memorial Theatre burned down. 23 April The new Shakespeare Memorial Theatre was opened by the Prince of Wales. 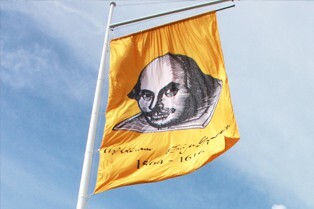 The Birthday Celebrations were jointly organised by Stratford Borough Council, the Shakespeare Memorial Theatre and the Trustees of Shakespeare’s Birthplace. Anti-apartheid protesters campaigned against the flying of the South African flag. The commemoration of the 400th anniversary of Shakespeare’s death. The ‘New Look’ Birthday Celebrations with the inaugural Community Carnival Parade and Living Statues competition.